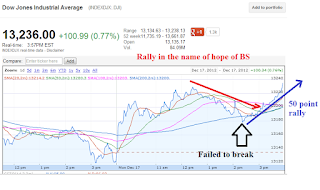 Dow jones and S&P500 is expected to open higher tomorrow on hope of something good will happen some day. Resistance on Dow jones are 13289, 13244, 13207, 13179. 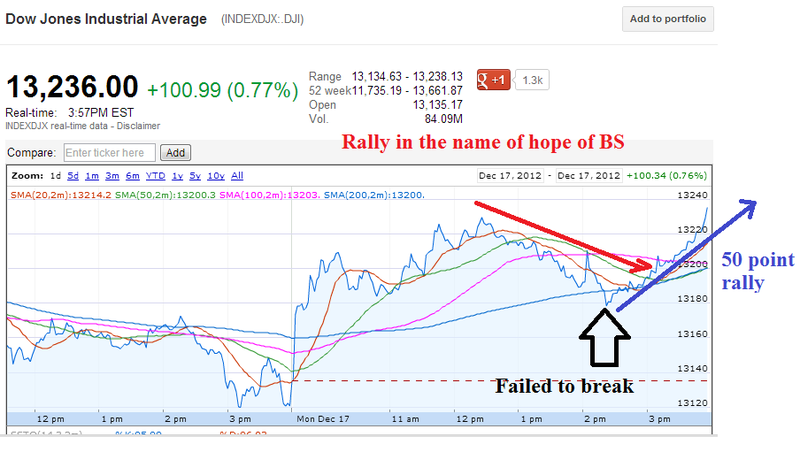 Avoid this market if you can as long as fiscal cliff is not resolved. US is now 9 Billion away from hitting debt ceiling. Dow jones has rallied 780 point in less then 20 trading days. FactSet Research Systems Inc. ( FDS ) is reporting for the quarter ending November 30, 2012. The business info service company's consensus earnings per share forecast from the 7 analysts that follow the stock is $1.11. This value represents a 8.82% increase compared to the same quarter last year. In the past year FDS has beat the expectations every quarter. The highest one was in the 3rd calendar quarter where they beat the consensus by 3.74%. The "days to cover" for this stock exceeds 18 days. Jefferies Group, Inc. ( JEF ) is reporting for the quarter ending November 30, 2012. The investment bankers company's consensus earnings per share forecast from the 6 analysts that follow the stock is $0.34. This value represents a 100.00% increase compared to the same quarter last year. In the past year JEF has met analyst expectations once and beat the expectations the other three quarters. Sanderson Farms, Inc. ( SAFM ) is reporting for the quarter ending October 31, 2012. The meat product company's consensus earnings per share forecast from the 7 analysts that follow the stock is $0.32. This value represents a -145.71% decrease compared to the same quarter last year. SAFM missed the consensus earnings per share in the 1st calendar quarter by -427.27%.